ABAP developers can create database connection to HANA databases using Database Connection Maintenance DBCO transaction on a SAP system. Using DBCO tcode or RSDBCONN ABAP program, developers can connect to a HANA database as a secondary connection to SAP system with a valid HANA database user authentication data. In this HANA tutorial, I want to show steps for defining a second database connection to a HANA database with DBCO tcode and how to verify if the connection is successfully created or not. Logon to SAP system that you want to create a second database connection to a remote HANA database system. Then launch SAP transaction code DBCO for Database Connection Maintenance screen. If you will be creating a new database connection for the first time on that SAP system, the list will be empty. Switch to change mode and press New Entries button to create a new database connection on SAP. Here is the initial database connection creation screen on DBCO transaction. First of all, type a descriptive name to your new database connection. As the second step, choose the DBMS type (which stands for Database Management System). This DBMS selection is very important because according to the selected DBMS the connection properties that the ABAP programmer should provide on the definition screen will change. 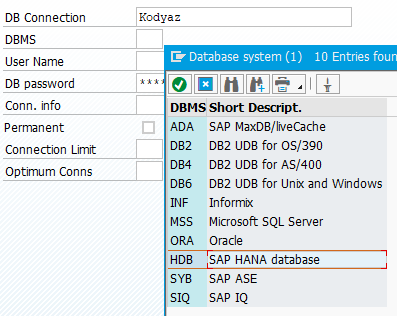 Since we target SAP HANA Database connection, choose HDB for the DBMS selection. The third step is providing a valid user authentication information; a valid database username and its database password. Please note that every time you make a change on this screen, you should provide the password for the HANA database connection user. The Connection Info field shows the target HANA Database system that we aim to connect using this new database connection. It is possible to get the database connection information if you are already connected to the HANA database on SAP HANA Studio. 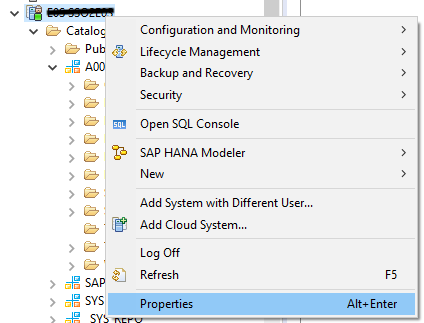 Right-click on the SAP HANA system and display Properties screen. On Additional tab, programmers can find the connection details like Host data. 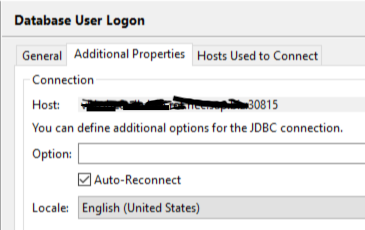 This is the connection information we will add on database connection creation screen on DBCO transaction.